Spring: As the water depths rise and temperatures warm, the fish in Table Rock Lake become more active and move into shallower areas seeking spawning locations. The King’s River has the most color and will warm first, followed by the James River. If targeting Largemouth Bass, look for areas with shallow wood cover in eight feet or less of water. Smallmouth and Spotted Bass will be in the clearer water from the mid-lake to the dam and can be found holding onto rock cover at 15 feet or deeper. Popular baits include: suspending jerkbaits like Smithwick Rouges or Lucky Craft Pointers, white War Eagle spinnerbaits, tight wiggling crankbaits like a Storm Wiggle Wart and small jig and craw combos such as a Jewel Eakins’ Jig and Craw. Once the spawn is complete fish will move out of spawning areas and suspend on points, bluff ends and drop offs as they feed on abundant threadfin shad. Top water baits like Heddon Spook or Lucky Craft Sammy are very effective both early and late in the day. Small buzzbaits, floating worms and Yamamoto Senko are all productive post-spawn baits on Table Rock. On windy days a 4″ single tail smoke colored grub on a 1/4 oz. head can be hard to beat on flat pea gravel points and flats. Summer: Most of the fishing on the lower end of the lake in the summer takes place well off shore. Spotted Bass are the primary target and can be caught on spoons, drop shot rigs and 3/4 oz. Jewel football jigs. The fish will generally be found holding on the sides of deep points from 30 feet to 70 feet deep. Using high-quality sonar units, fishermen will locate schools of spotted bass and drop baits directly into the school to trigger strikes. While not impossible to catch, Smallmouth become pretty tight lipped in the heat of summer and most are caught on the bottom holding tight to rock cover. Shaky head worms, Jewel spider jigs, Chompers’ spider grubs and tubes work from 25 feet to 45 feet deep. Largemouth can be found in the stained water of the James and Kings rivers, 8 inch and 10 inch Berkley Power worms, Jewel Heavy Cover Football Jigs and deep diving crankbaits like DD-22’s and DT-16’s in chartreuse or shad colors, are the most effective baits. Look for Largemouth to be on points near main river or creek channel drops. Target isolated brush piles and standing timber to be effective. Fall: Much like the Spring, Fall is a transition time for bass on Table Rock. Fish move out of their deep water summer haunts following schools of shad as they move toward the backs of creeks in search of zooplankton blooms. Channel swing banks and points close to channel swings become very important in the fall. These areas act like holding areas for both shad and bass causing both to “bunch up” making the bass easier to catch. Productive baits include Jewel spider and football jigs, Storm Wiggle Wart crankbaits and War Eagle Spinnerbaits and buzzbaits. Look for wood cover on these types of banks in the James and Kings River areas. Mixed rock will hold Smallmouth in the lower end of the lake and Spotted bass can be found on either wood or rock of cover. Winter: This can be one of the most productive times of the year for Spotted and Smallmouth bass. Both species will school together and follow large schools of threadfin shad into major creek arms and up the river arms. A quality sonar unit is crucial to find and catch these fish. Usually suspended over water from 40 feet to 150 feet deep, they use the shad as cover and a source of food. During this time of year, an effective bait of your choice will help you find the fish in strong numbers. Spoons, drop shot rigs and blade baits are your best bet and once the fish are located it is a matter of dropping the bait in front of them to trigger a strike. Fishing small jigs like an Eakins’ jig or a 1/4 oz. buck hair jig is a good secondary pattern in the winter. 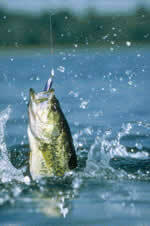 Deep rocky points and bluff ends will hold all three species of bass from 10 feet to 35 feet deep. Spring: Rising warm waters in Spring draw fish from the lower depths of Bull Shoals causing them to become more active in seeking shallow spawning locations. The colored water of the Theodosia arm will warm first followed by the larger creeks like Big Creek and the Sugarloaf Creek Arms. As the fish move, shallow specific cover becomes important to each species. 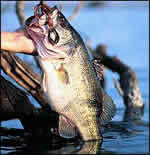 Largemouth Bass tend to hold to wood cover like laydowns and brush piles. Spotted Bass will move to chunk rock points and bluff ends and Smallmouth Bass will hold on isolated rock piles and mixed pea gravel and rocky banks. Popular baits include: suspending jerkbaits like Smithwick Rouges or Lucky Craft Pointers, 4″ single tailed grubs on 1/4 oz. jig heads, tight wiggling crankbaits like a Storm Wiggle Wart, and small jig and craw combos such as a Jewel Eakins’ Jig and Craw. After the fish have spawned they will move into open water and suspend. Top water baits like Cotton Cordell Redfins, Heddon Spooks and Lucky Craft Sammys, are all very effective. Bull Shoals has a tremendous reputation for its walleye population. In early spring walleye will make a run up the White River, Theodosia Arm and some of the major creeks to spawn. When making their spawning run, walleye will “stack up” in deeper pools and channel bends, suspending jerkbaits, single tailed grubs and small crankbaits are all effective baits for these fish. Summer: Summer (especially early and late in the day) offers some of the most exciting action on Bull Shoals lake. Schools of Spotted Bass chase shad on the surface during the low light hours of the day. Top water baits like Heddon Spooks, Lucky Craft Sammys and Cotton Cordell Redfins will all catch these aggressive bass. During the heat of the day, conditions can be much tougher. Look for fish to move out to deep ledge rock points and channel banks up to 50′ deep. Jewel football and spider jigs matched with a Chompers’ jig trailers, tube baits, and Carolina rigged french fries or finesse worms are all effective baits during the summer. Slowly work the bottom in these areas paying special attention to any wood or rock cover you may run into with the bait. Largemouth will tend to be in shallower areas than Smallmouth or Spotted Bass and they will hold in the large number of brush piles set by Arkansas Game and Fish Department and by individual anglers. Texas rigged Berkley Power worms and Jewel Eakins’ jig and craw combos are your best bet in the heat of the day. The majority of the walleye caught during the summer are taken in the upper half of the lake by anglers trolling bottom-bouncing live night crawler rigs and jigs tipped with minnows from 20 feet to 40 feet deep. Fall: Cooling water in fall revitalizes the fishing on Bull Shoals. Ledge rock points and channel swing banks on the main lake and in major creek arms, are primary locations to find all three species of black bass. Jewel football and spider jigs matched up with Chompers’ jig trailers, tube baits and tight wiggling crankbaits like Storm Wiggle Warts are all important baits in these areas. Large willow leaf bladed spinnerbaits used near standing cedar trees can produce big Largemouth this time of year. Cast beyond the timer and run the bait directly into the tree to be successful. Walleye can be caught in the same locations as bass in the fall, suspending jerk baits like Smithwick Rogues or Lucky Craft pointers are key baits. Some of the biggest walleye taken every year are caught at night in the fall on flat gravel points and flats with suspending jerkbaits. Winter: The deep clear water of Bull Shoals is perfect for offshore fishing in the winter. Groups of Spotted Bass follow large schools of threadfin shad throughout the lake using them as both a source of food and cover. As the water temperature drops several shad will die off and drop down to the waiting bass. Using high quality sonar anglers will find these schools of shad and the groups of fish below them. Drop spoons, drop-shot rigs and blade baits through the shad mimicking the dying shad and triggering strikes from the bass. Walleye are difficult to catch and find until late winter when they being to make their annual spawning run up the rivers and larger creeks in the upper end of the lake. Below the Table Rock Dam to the mouth of Fall Creek: This area is managed by the Missouri Department of Conservation as a fly fishing and artificial lure only area. In addition there is a slot limit on trout that are harvested in this area. The majority of anglers in this area are fly fisherman, without current from the generators at the Table Rock dam the upper portion of Taneycomo fishes like a large trout stream; pools, riffles and wood cover are all important areas to fish. Productive fly patterns can change for day to day or even hour to hour so be sure to check the reports before you go. The most reliable patterns will be scuds, sow bugs and other nymphs most of the time, but productive colors will change. Anglers with casting and spinning equipment will fish this area as well with small spinners or small twitch baits like Rapalas and Lucky Crafts. Despite the amount of fishing pressure this area receives it remains a quality fishery due to daily stocking by the Department of Conservation with trout from the Shepard of the Hills Hatchery located below the Table Rock dam. Trout Fishing from Fall Creek to Powersite dam: From Fall Creek on down stream the majority of anglers will fish live and prepared baits. While fly fishing still takes place, the majority of fisherman utilize a “Taneycomo Drift Rig” with live night crawlers, red worms or assorted colors of Berkley power bait eggs and nuggets on casting or spinning equipment. Boating anglers will run up stream a few miles from their launching point and then control the drift back against the current making casts to deeper pools and wood cover along the banks. Productive lures in this area include; twitch baits like Rapalas and Lucky Craft pointers, small spinners like Rooster Tails, Mepps, Super Dupers and Panther Martins or small crankbaits such as Norman Crappie Crankbaits or Yozuri Snap Beads. The “Taneycomo Drift Rig” will also work as you drift down the lake, simply cast and allow the rig to bounce the bottom. This portion of the lake also holds all of the public and private trout docks. Most anglers fishing from the docks will fish on the bottom or with a float around the dock with either live or prepared baits. 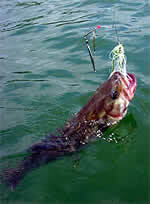 Bass Fishing on Taneycomo: One of the best kept secrets in the Ozarks is the bass fishing on Lake Taneycomo. While bass have been caught above the Downtown Branson area most bass fishing takes place in the lower end of the lake from Bull Creek near Rockaway Beach to the Powersite dam. Most of the fish are caught on either the abundant wood cover that dots the shoreline or on the ledge rock that marks the channel swing areas of the lake. Unlike the warm water lakes on either end of Taneycomo, the colder water keeps bass more active throughout the year. With this in mind Lake Taneycomo bass will chase reaction baits like spinnerbaits, buzzbaits and crankbaits for a greater portion of the year. Big bass seem to show up every year on Taneycomo, with several bass over five pounds being caught with regularity and a few over eight pounds becoming more and more prevalent. Big fish tend to be caught in the cooler months on the deeper drops close to ledge banks with Jewel Eakins’ Jig and Craw combos and football or spider jigs accounting for many each year.